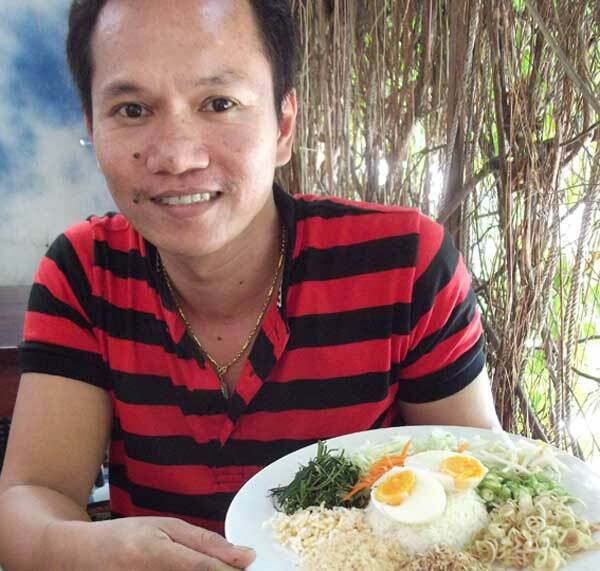 Khao Yam Songkhla owner Amnuay Pijit. PHUKET: For those who are after a healthy food option when dining at a Thai restaurant, consider ordering khao yam – a salad dish consisting of steamed rice, vegetables, and a special salty, sweet sauce named nam budu. Popular across southern Thailand, one of the best places to try this in Phuket is at Khao Yam Songkhla, owned and run by Amnuay Pijit, which is located on New Dibuk Rd, opposite Dibuk Guesthouse. In operation for more than 13 years, the recipe he uses has been passed down from his wife’s family. Raw ingredients include roasted coconuts, dry shrimp, green mango slices, cucumber slices, string beans, lemongrass slices, pepper, bean sprouts and boiled egg. Steamed rice is served too. The ingredients of the nam budu sauce include ground shallots, garlic, galangal (blue ginger), lemongrass, kaffir lime leaves, plus sugar and fish sauce. All ingredients are boiled together for two hours, then filtered. This leaves the nam budu with a salty and sweet taste. Mr Amnuay said he sometimes adds ground chilli to the sauce to give it flavour, and he always makes sure the vegetables are fresh. Khao Yam Songkhla is open Mon-Fri, 8am-3pm. Call 089-867-6765 for more info.